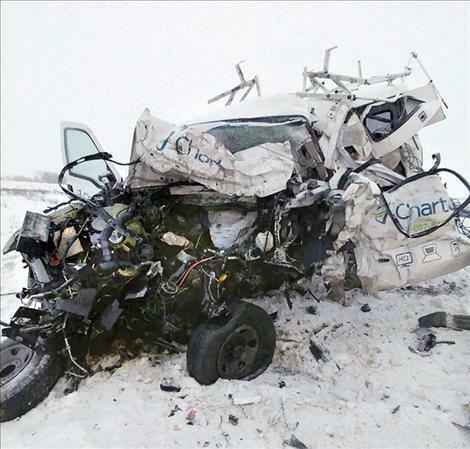 Jacob Paul Imhoff was ejected from the Ford truck he was driving after hitting a tanker truck head-on Dec. 23. Imhoff died at the scene. 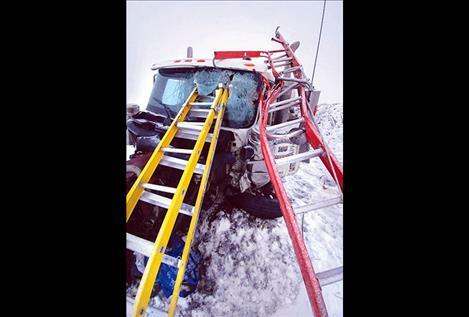 NINEPIPE — The Montana Highway Patrol suspects that speed was involved in a fatal wreck that closed Highway 93 in the Ninepipe area south of Ronan late Friday afternoon, Dec. 23. Jacob Paul Imhoff, 22 of Lakeside, was ejected and died at the scene of the crash, according to Lake County Sheriff Don Bell. MHP dispatch said Imhoff was driving northbound, passing cars in snowy conditions, when he collided head-on with a southbound tanker truck driven by a 46-year-old Arlee man. Imhoff was driving a Charter Communications truck. The impact sent the truck’s ladders through the windshield of the tanker truck, which was reported as a Town Pump vehicle with empty tanks with no leakage. The Arlee man was taken to St. Luke Community Hospital with non-life-threatening injuries, according to MHP dispatch.